For all of you who are used to “A Little Bit Friday” today will be quite the opposite! It’s time for the Award Tribute to Funky/Wishing On A Starr. I want to start with a big I'M SORRY!!!! On the previews and the filenames I have made the big mistake of calling it Wishing UPON a Starr... It should of course be Wishing ON a Starr. But correcting everything would have caused a day's delay and I wanted to get this out today. So I hope you can forgive me Funky!?!?! 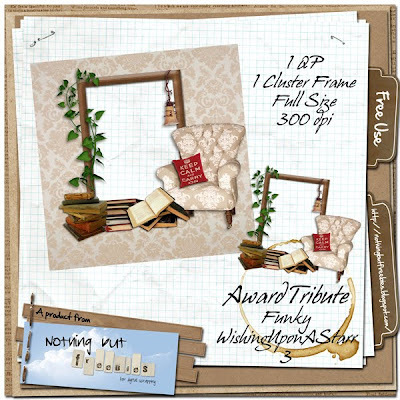 If you are not familiar with Funky and her blog I can tell you that she is spoiling us rotten with great freebies and most of them have no TOU attached! I always get in a good mood when visiting her blog because she is a positive, energetic and extremely creative lady. And if you read about the cause for her blog and all the other obstacles in her way that spirit is AMAZING! I have made you some different freebies from her material and in her spirit I have made their TOUs as free as possible. I have also included a Bonus that I think of as “Because I know you LOVE it”-Bonus. I hope you’ll like it all and after downloading hurry over to Funky to get “The Real Deal”. 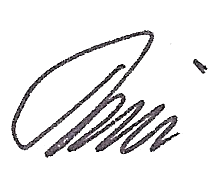 Click each image for direct download. 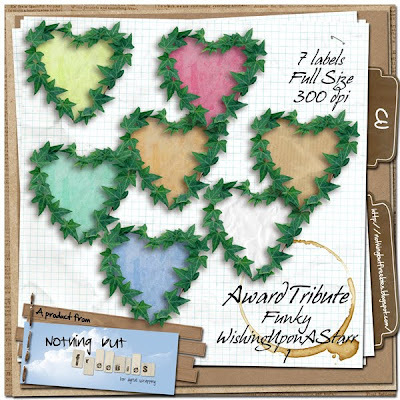 Freebie #1 is a bunch of labels with foliage border. Next you get a paper pack with 5 papers and a page frame. Then it’s time for a QP. I have also included the cluster frame separately. 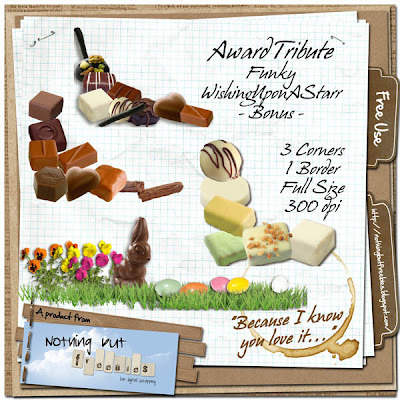 And finally - You all time favourite Chocolates! 3 corner clusters and a special Easter page border. Enjoy and have a great Easter Weekend. I’ll be back with the final Award Tribute for Atomic Cupcake as soon as possible (I hope tomorrow, but no promises). What a beautiful job you've done with the creations.....absolutely gorgeous. thank you so much! Love today's tribute!! Have a Happy Easter!! Thank you so much for this post. I want to let you know that I posted a link to your blog in CBH Digital Scrapbooking Freebies, under the Page 12 post on Apr. 23, 2011. Thanks again. Thank you so much for the lovely freebies, and God bless!